Nestled among the verdant hilltops near Sorrento, the Hotel Cristina overlooks the small town of Sant’Agnello and across the Tyrrhenian Sea to the Bay of Naples. Here you can enjoy an authentic Italian escape where the heavenly scents from olive and lemon groves forever hang in the air, and time can be spent poolside with an enthralling read or Aperol spritz in hand. 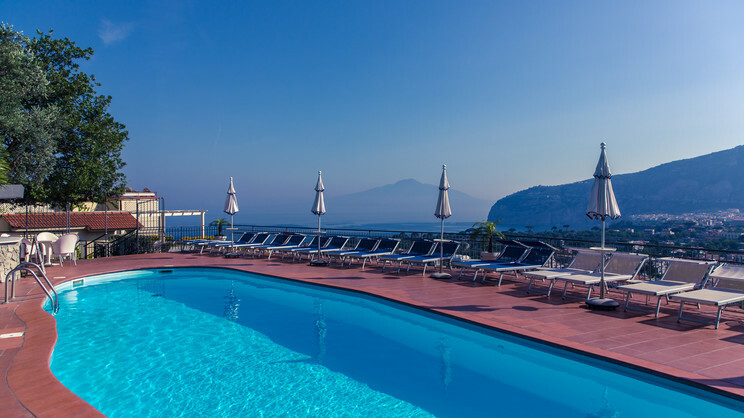 The hotel also provides a shuttle service into the pretty town centre of Sorrento, to ensure that guests get the best of the Neapolitan Riviera. The nearest beach can be found close to the town centre of Sorrento, which is approximately 2km away from the Hotel Cristina. There are a small number of shops, bars and restaurants close to the hotel and the town centre of Sorrento is accessible via the complimentary shuttle service ran by the hotel. Naples International Airport is approximately 1.9km away from the Hotel Cristina Sorrento.